Description: Where can I find these Web 2.0 resources? When can I start using these new Web 2.0 technologies? How can I keep up given my busy schedule? These are comments often heard from Cybrarians after they have attended a conference or workshop presentation on Web 2.0 and allied technologies. The answers to these questions and much more will be addressed in this presentation by librarian and self-professed Web 2.0 advocate Cheryl Peltier-Davis. This presentation will highlight free Web 2.0 tools on the Internet, offering in-depth summaries and practical applications of these technologies in libraries and other working environments. Coverage is wide-ranging, catering to the needs of most tech-savvy attendees: creating a book review blog, social bookmarking a reference collection, creating subject specific RSS feeds, developing a policy driven wiki, recording a podcast, creating a tutorial using digital video, attracting fans on a Facebook page or providing regular tweets on upcoming events in the library. Attendees will discover dozens of resources which hitherto have remained hidden, or re-discover tools which they may have used and found helpful. 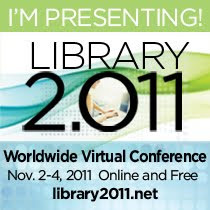 This presentation is guaranteed to be beneficial to librarians and other information professionals wishing to harness the potential of Web 2.0 technologies in providing innovative, value added services at their workplace and keeping up to date with developments in this highly dynamic and fast-moving area. INSPIRING ME THANKS FOR SHARING. I have been reading your blog for a while and thought I would completely pop in and drop a friendly note. It is great stuff indeed. I also wanted to ask..is there a way to subscribe to your site via email?